The cover story of today’s Los Angeles Times HOME section features “Finally back in its prime,” my profile of the Daily House, a beautifully restored, circa 1954 “mod pad” in the LA suburbs of Glendale. 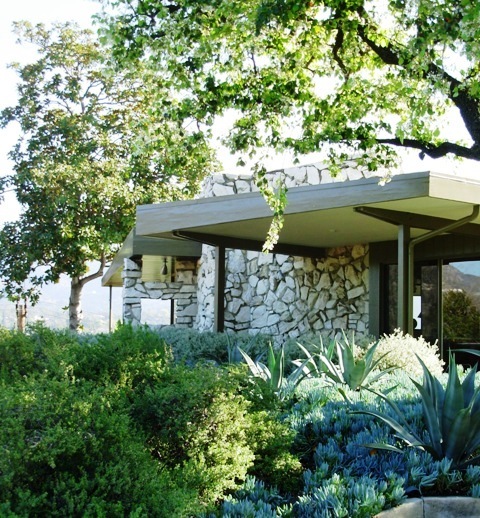 Straight out of “Mad Men,” the house has been a decade-long project of its young owner, Christophe Burusco. Check out the Times’ web gallery here, with images by staff photographer Al Seib. I had hoped to include a sidebar on the garden, but space limitations got in the way. 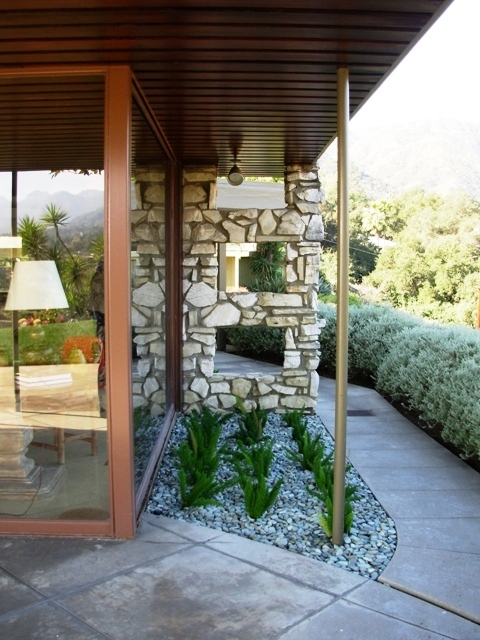 My interview with Kathleen Ferguson of Los Angeles-based Kathleen Ferguson Landscapes reveals her excellent ideas and tips for approaching the exterior design of a retro home. Here it is, along with my photographs from visiting Chris and touring his home and garden. Three major trees were saved, including a huge magnolia beyond the home’s glass-walled corner (which serves to enhance and frame the views of the San Gabriels). Near the front entry, Ferguson was able to save an evergreen pear (Prunus caroliniana) and a Japanese maple. The beautiful forms of these two trees had been difficult to appreciate, due to a greenhouse that was plunked down between them by the original owner of the home. Chris removed the greenhouse and its concrete foundation, giving the scene much-needed negative space. In its place, Ferguson added geometric poured-in-place concrete pavers that echo the lines of the home and lead visitors to the garden’s side entrance. “We really wanted the pavers to look like something that had been there already, which is why we did a random pattern,” she says. The level front yard slopes down to the street, creating a dramatic perspective as you approach the house. There, Ferguson staggered agaves on the low hillside. Mass planted, the scale and form of the agaves is ideally suited to the rugged texture of the Palos Verde stone-clad house. Between the agaves, ornamental grasses appear as a softening device. 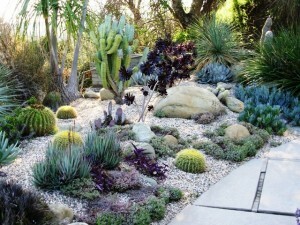 “Together, the native succulents and ornamental grasses mimic the native surrounding plant palette,” Ferguson says. As you walk along the side towards the home’s back garden, you can’t help but appreciate architect Clair Earl’s artisitic detailing. He punched a trio of “windows” in a stone accent wall, which invites you to view the San Gabriels through these carefully framed scenes. 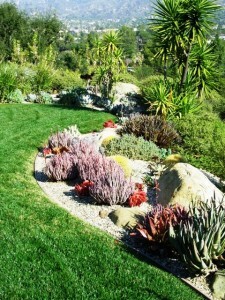 The garden’s piece de resistance is a cactus-and-succulent border that arcs around the edge of the small lawn and patio area. Here, Ferguson worked with some of the mature plants installed by Mrs. Daily Russom, who Chris says was involved with the cactus garden at the Huntington. “Jean (Daily) loved succulents — she had a lot of amazing specimens that we wanted to keep,” he says. By blending new succulent hybrids with the established, mature varieties, the expansive border is now a spectrum of cool-to-warm tones and contrasting shapes. The design starts with clumps of striking, blue-gray Agave parryi, moves into purple-black rosettes of Aeonium arboreum ‘Zwartkop’ paired with sculptural paddle plants (Kalanchoe luciae) and leads to eye-pleasing multiples of golden barrel cactus (Echinocactus grusonii). The border, which runs the length of the house and can be seen from most of its rooms, is now mulched with a warm salt-and-pepper gravel (which replaced what Chris called “big ugly rocks”). 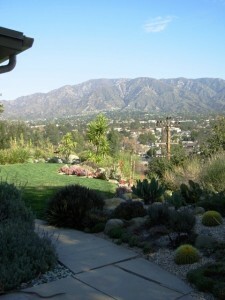 The cultivated landscape in the foreground blends with the San Gabriel Mtns. in the distance. Ferguson is most inspired by the tension created between the landscape and the house; between the architecture and the wild setting beyond its domestic borders. “Chris’s landscape has a lot of push-and-pull,” she says. There’s the smooth against the rough; grey-greens against the rich greens. And there’s the contrast between the garden and the arid, native chaparal around the perimeter. I think it’s a pretty stunning treatment, worthy of this historic, but thoroughly modern, abode. This entry was posted on Saturday, March 27th, 2010 at 1:07 pm	and is filed under Architecture, Creativity, Gardening, Landscape Design, Plants, Writing. You can follow any responses to this entry through the RSS 2.0 feed. You can leave a response, or trackback from your own site. 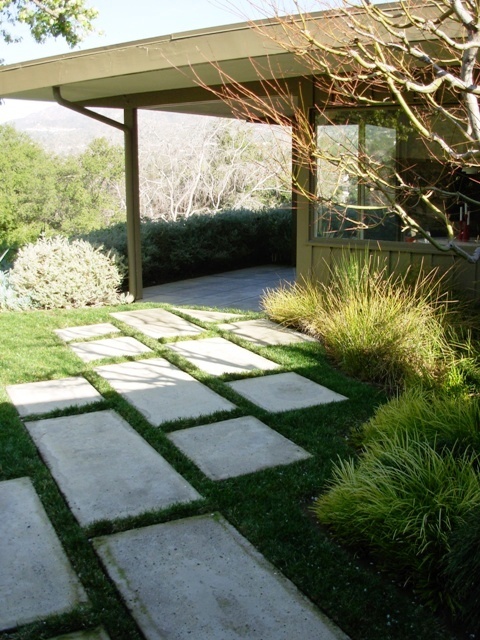 The garden’s lines seem perfect for the mid-century home. How nice to see one restored so well. Sometimes, I don’t think about how there is nostalgia for mid-century modern as I was alive in 1962. But, since I’m growing older, of course there would be. It is a fun thing. Truly lovely garden resurrection. So glad the lawn wasn’t sacrificed. Every time I think about how much water it might save- a hummingbird swoops low… a bunny muches…. I loved this story, but here is the clincher…your words about needing “negative space.” YOU SO GET IT! Saved the L.A.Times article, revisiting it often. This is my favorite home of ALL. Right up there with the Neutra Hoffman house in Palm Springs. The home exhibits a wonderful sense of warmth. The garden ties the whole experience together. I have been subscribing to Dwell, Modernism, Atomic Ranch for years. No other home story I have personally read has had such an impact on me. My wife and I would some day love to tour the Daily home.